Not a great effort, but not bad for a freehand doodle on the train. I love a good doodle, me. I’ve always had a spare pad of paper, notebook, or dedicated few pages at the back of my school book where I could draw. These range from random scribbles while on the phone, to slightly more involved patterns and pictures, moving ever so slightly more towards the more drawing, rather than doodling. I tend to draw things on a theme. I like doing female faces in a kind of cartoon or manga style. I’ll draw tattoo-flash style pieces featuring script or things I like such as bicycles and mountains. I have a thing for drawing squid and octopus, in a stylised way. When I’m drawing, it’s almost like mediation. I’ve always found focussing and letting go in the kind of meditation I’ve tried before, where you sit still and empty your mind, extremely difficult. I find it much easier when focussed on a task. Having read up more about it recently, I guess what I’m doing is a kind of Mindfulness – focussing completely on the here and now, rather than letting my thoughts get scattered around the place. There’s some good information on benefits of Mindfulness on the Headspace website, and also BeMindful. I’ll sit for hours, literally, drawing lines, dots, shading, colouring. I have a particular thing for clean lines, which may or may not be inspired by my early love of celtic knot work, or perhaps I love that because I love lines. Who knows. So most of the doodles I do involve clean lines of various thickness. I like pointillism for shading. My favourite pens in all the world are very fine black pigment liners. Ideally, I’ll have a 0.5 for thick lines, and a 0.3 and 0.1. The 0.1 is my favourite, as I can make beautiful, thin, precise lines that snake and weave across the page. The joy of building a picture, of filling a blank page, of seeing how the picture turns out as it comes out of my head and into reality, is addictive and soothing and reassuring. Sometimes, I can’t draw. It’s usually the fear of the blank page. I want the image to be perfect, but how can it be when I haven’t made it yet, when I haven’t mapped it out. It has to be created before it can be refined, and it’s taken me a while to work out that just starting anywhere is okay, that something is better than nothing, and that an idea can be beautiful even if it’s not what you thought it would be. When I’m drawing, everything else disappears. I get lost in the process, filling areas, joining dots, planning which line will go where next. All the chatter, all the stress, all the million things I always have to do disappear for a little while, and it’s just me, the paper and the pen. Why doodling and not drawing? I think for me doodling sounds less formal, and therefore holds less pressure of having to make it good, make it something that people will judge. Doodling is mostly just for me, and if it’s good, if I’m happy with it, well – that’s a bonus. I stopped doodling for a long time over the last 2 years, and have only really started again. I was so busy and stressed with other things that I didn’t allow myself time to do it. ‘I don’t have time to doodle’ I thought. ‘If I have time to do that, I should be doing the other things that I have to do!’ But I was wrong. A few minutes, a few hours spent doodling, and I’m full of ideas, and feeling much calmer, so it’s time well spent. I didn’t put it in my New Years Resolutions list, but maybe I should. 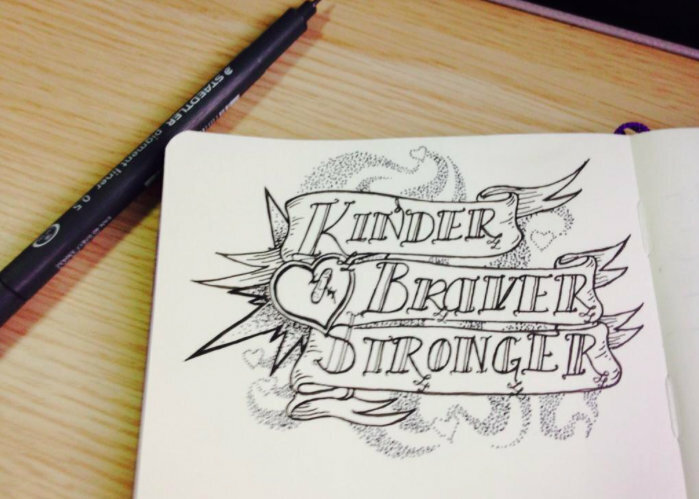 2015 – the year of the Doodle. I love my little Juliana Furtado mountain bike. I bought her in 2013 after test riding a similar bike for Total Women’s Cycling, and completely fell in love. She’s beautiful, capable, speedy, talented – in fact pretty much perfect for most of the riding I do in the UK. The Gigantic Beard That Was Evil at the Bristol Old Vic, 2015. What a great title, right? It’s the title of a play based on a best-selling graphic novel of the same name, written by Stephen Collins, and performed by the Bristol Old Vic Young Company. 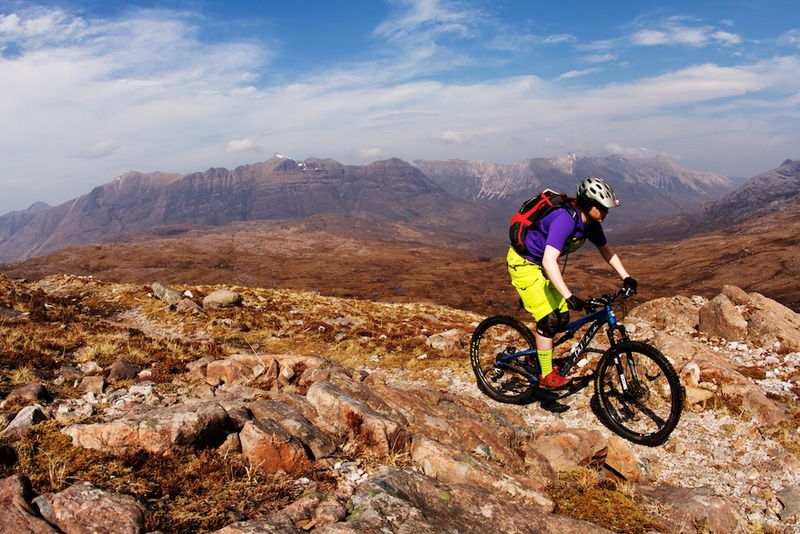 In 2014, I went mountain biking in Torridon, Scotland. 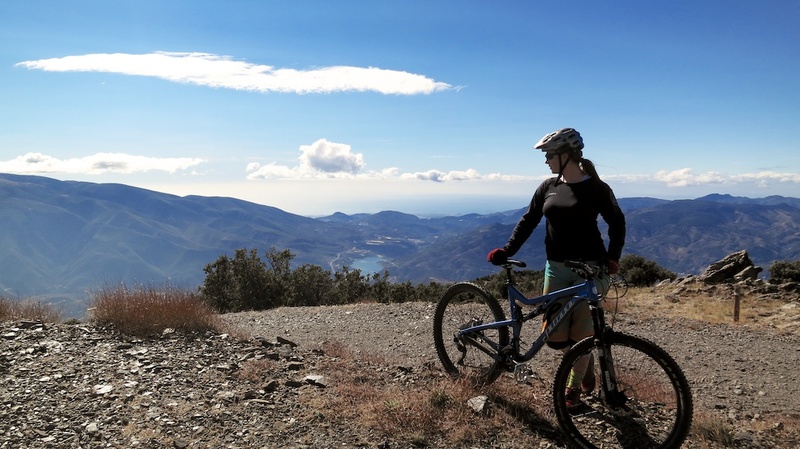 I really want to ride there again in 2015 – and you can see why. I’ve got a lot of general New Years Resolutions (including giving blood, reading more books, you get the idea) but as a lover of lists, I’ve also got a whole separate set of Cycling New Years Resolutions. Cycling is a pretty big part of my life, whether it’s road cycling or mountain biking, or just bimbling about here and there. I’m not particularly good, not particularly fit (working on that one), and mostly just in it for the fun. But wow, what a lot of fun it is! New Years Resolutions – bring on 2015! 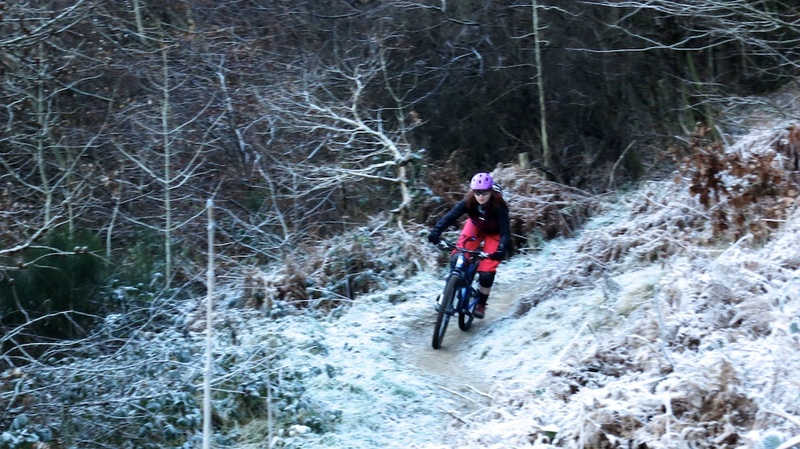 Winter mountain biking in Cwmcarn, Wales. I’ll be doing LOTS more of this in 2015. I always like to do New Years Resolutions. I know a lot of people don’t think they are a good idea, and I can understand why. Giving yourself hard targets that you can beat yourself up over if you don’t make doesn’t really sound like a great idea. I guess I view them in a more general sense. My resolutions are a combination of things I wish I’d done a bit more of over the year, because I know they help me be me, and a better me (like yoga and reading books) and also activities and adventures I’d like to have. I don’t expect to do all of them, but listing them helps me focus on where I’d like to go and what I’d like to do in the year ahead. 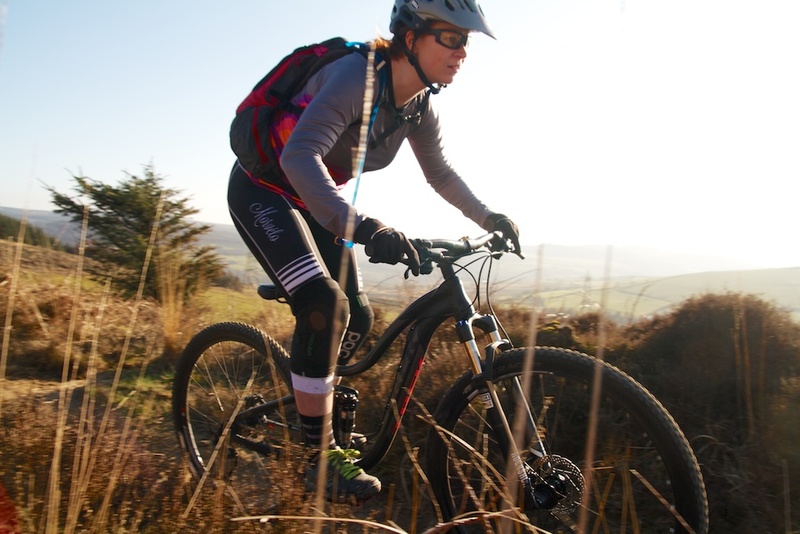 I’m a big fan of 3/4 length bib shorts, especially for mountain biking, as I tend to get too hot in full length tights and knee warmers just annoy me – I’ve yet to find some that don’t roll down as I ride. But they can be hard to find. Cycling bib-tights. Or, to be more accurate, women’s 3/4 bib tights. If you’d asked me a few years ago if I’d have a large selection of them in the MTB kit side of my wardrobe, I’d have been quite amused. For road cycling, they are very handy, but for mountain biking…? This morning I arrived into Edinburgh on the Caledonian Sleeper train. I came out of the station, in search of breakfast, and the the first thing I noticed was imposing rocks of Arthurs Seat, silhouetted in the morning sunshine, visible from my vantage point in the centre of town.